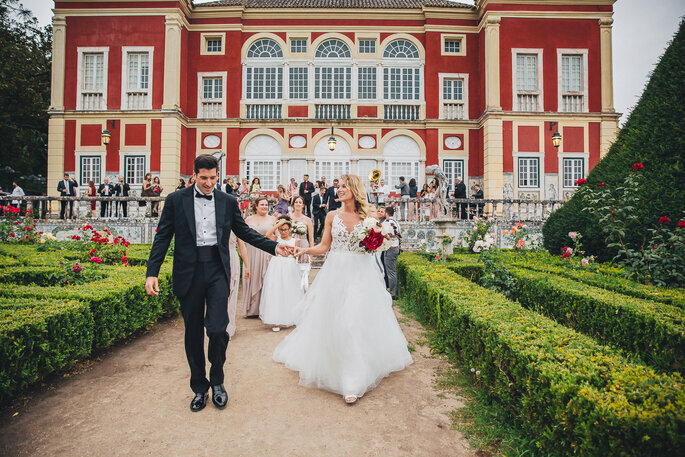 Lindy and Aaron travelled thousands of miles from Oregon to Lisbon, Portugal for their big day - and it was completely worth it! 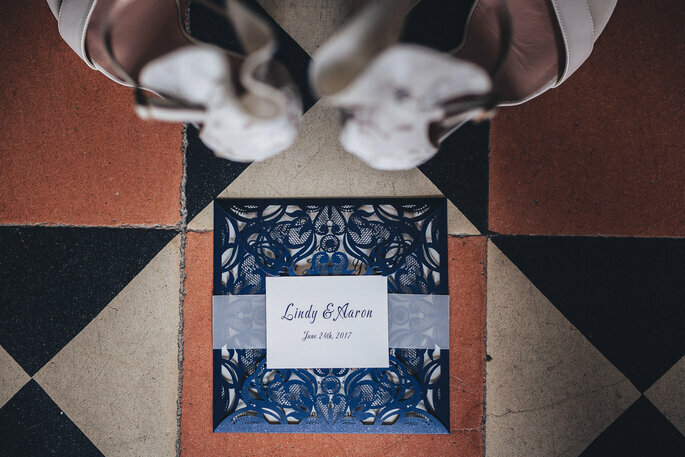 Check out their gorgeous photos, so generously provided by the wonderful team at Aguiam Wedding Photography - you're going to love them. 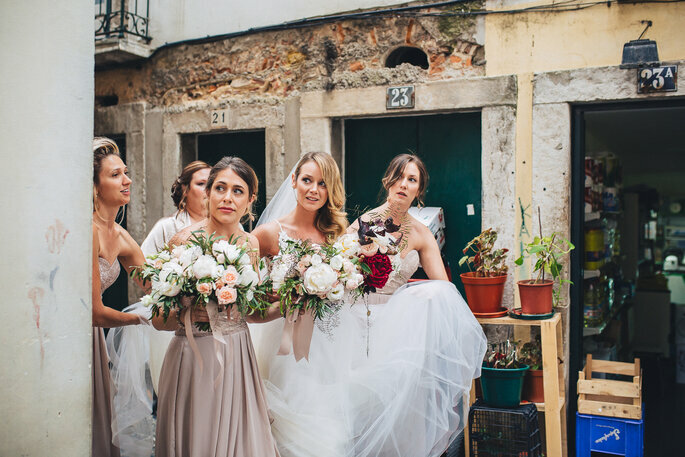 Lindy and Aaron, a couple hailing from the beautiful state of Oregon, last summer made the brave decision to host their big day in Lisbon – the heart of southern Portugal, and the country’s capital city. 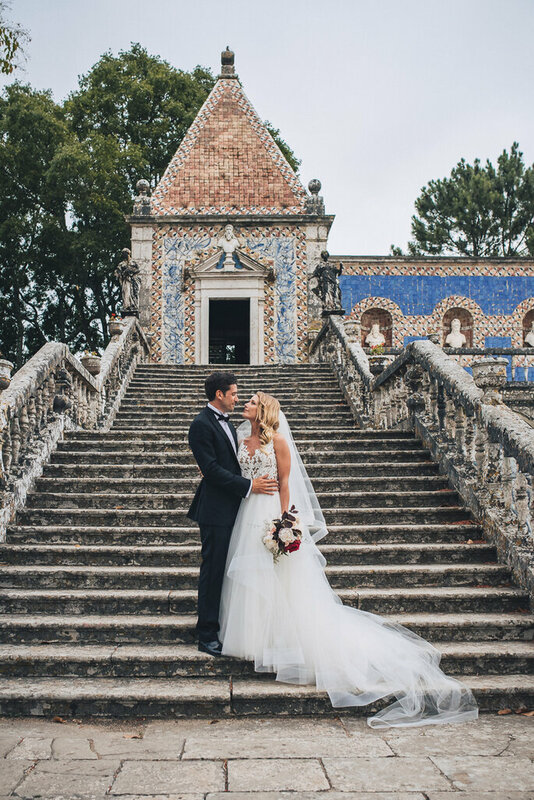 Organizing your wedding abroad can be a big step, but as Lindy and Aaron found out, one that is insurmountably rewarding, particularly when the destination that you choose is as beautiful as Lisbon! This vibrant city teems with life, a perfect combination of traditional architecture and décor and new innovative styles and customs – and all with the most enviable coastal view. 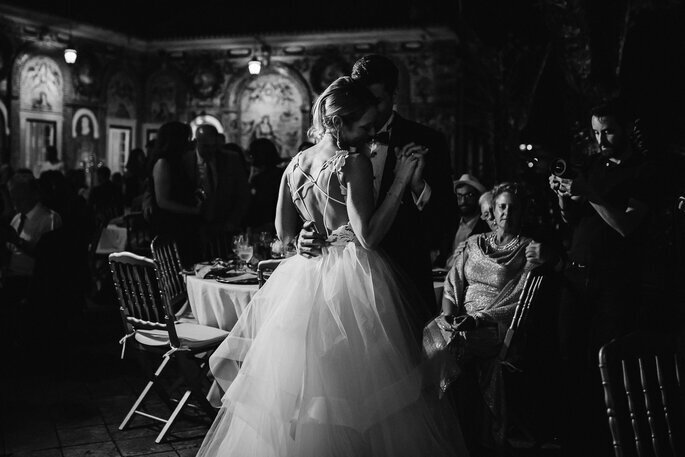 The beauty of the city not only makes it perfect for a Destination Wedding, but a joy for the photographers who are in attendance. 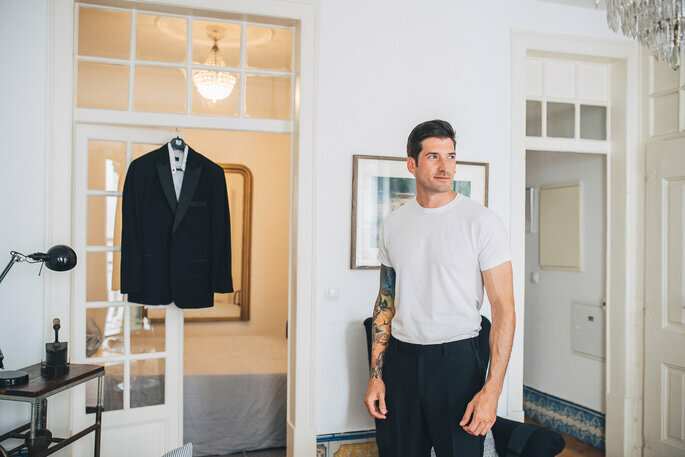 In this case, Aguiam Wedding Photography absolutely blew us away with their images of Lindy and Aaron’s big day, amplifying the natural beauty of Lisbon to transcendental levels. Scroll on to have a closer look at the pictures! 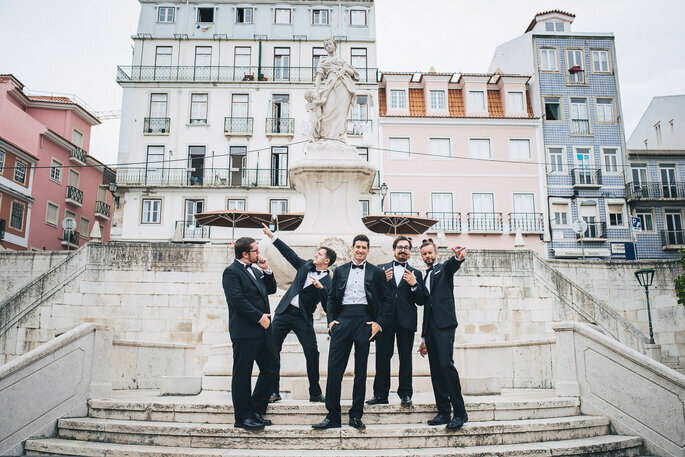 Aaron and his groomsmen looked cool and collected in their sharp suits, with double-breasted black blazers and bowties, reminiscent of those classic James Bonds movies. The black cummerbunds are also a nice classy touch, perfecting their looks. 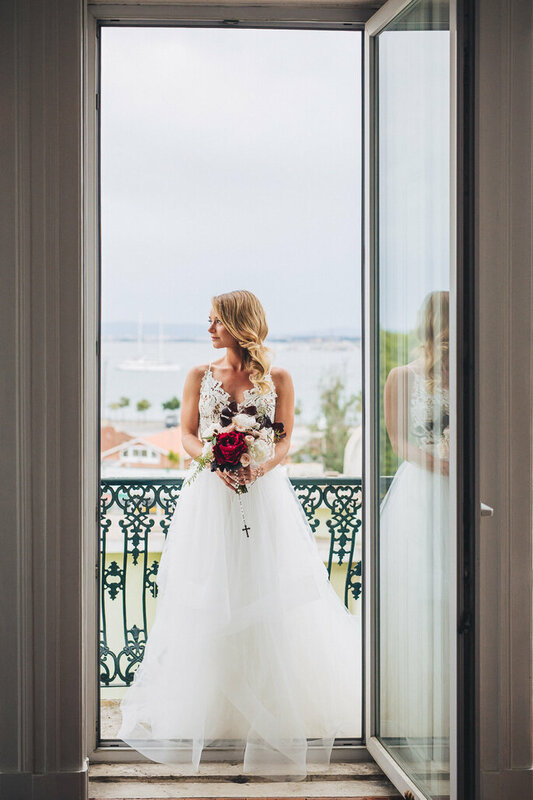 Lindy wore a beautiful gown for her wedding day, with a finely embroidered lace bodice with a coy sweetheart neckline, and a long flowing tulle skirt that looks almost ethereal in the beautiful photos Aguiam Photography has provided us with. 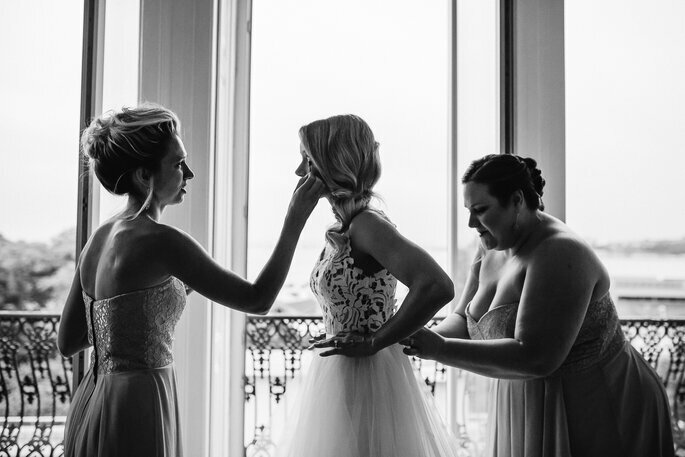 She made her wedding morning that much more intimate by asking one of her closest friends to do her makeup for her, and enjoyed a small celebration with her bridesmaids as they prepared. 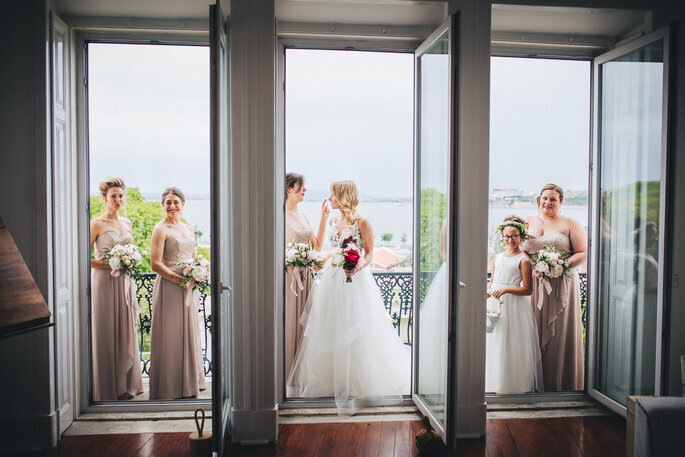 With a stunning color scheme of deep reds, dark lilacs and pale peach, Lindy looked every inch the bride. 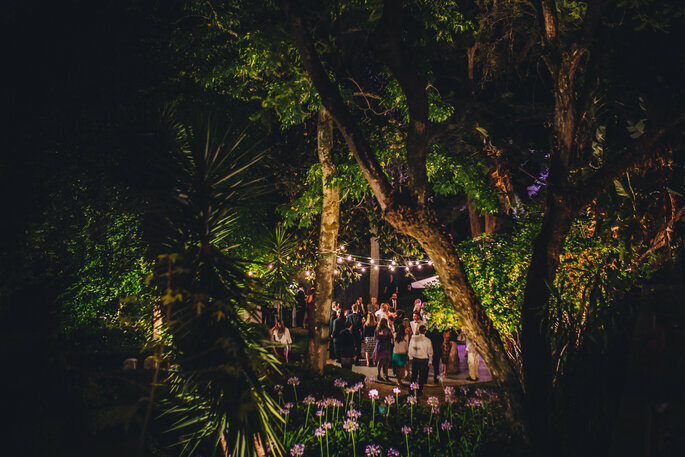 The venue for Lindy and Aaron’s wedding was truly special. 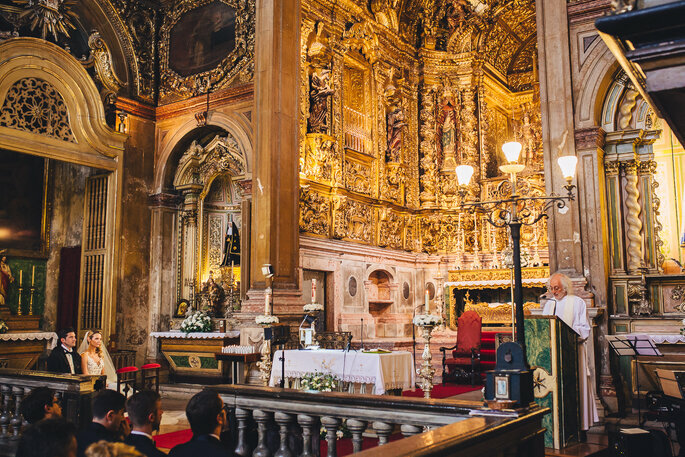 The São Miguel Church in the Alfama District is a stunning Baroque-style building, and a photographer’s dream for all of its intricate gold features, rich architectural construction, and its veritable bombardment of religious art. The church dates back to the 1100s, but was rebuilt in 1673, with two bell towers. 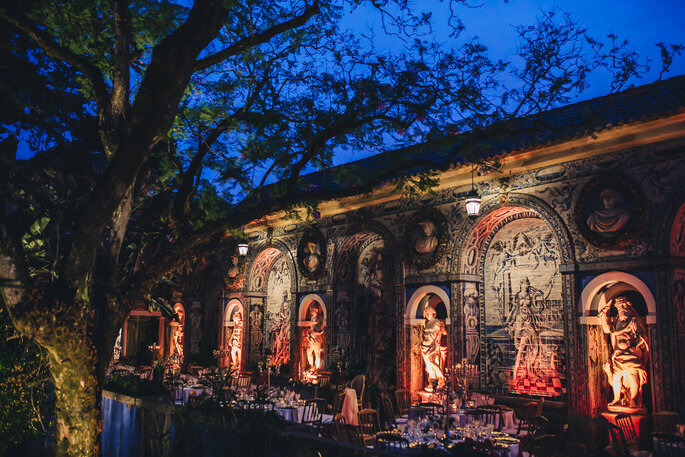 It survived the 1755 earthquake, preserving one of the richest gilded decorations in the city and paintings by Bento Coelho da Silveira, one of the most prominent Portuguese artists of the 17th century. 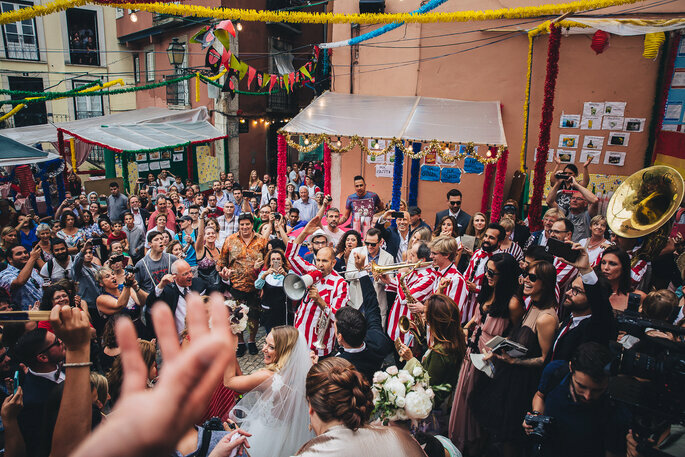 The ceremony was attended by many members of the couples’ families, and their friends – an unusually large turnout for a wedding abroad! 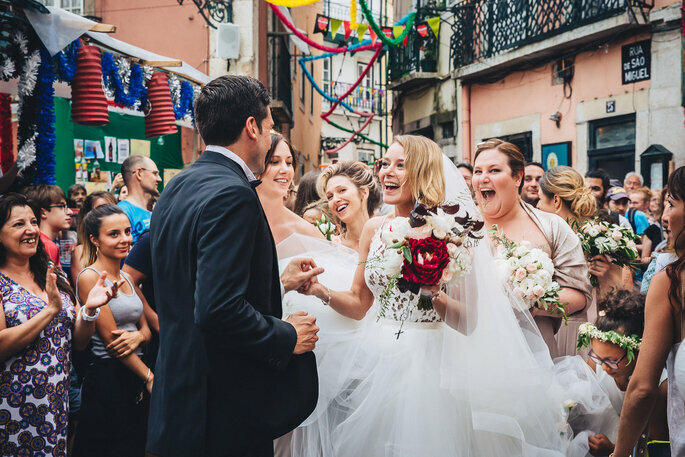 Getting married in June in Portugal meant that Lindy and Aaron’s wedding was accompanied through the streets of Lisbon by locals celebrating the festival of Santo António – which lasts from the first day of the month to the last! 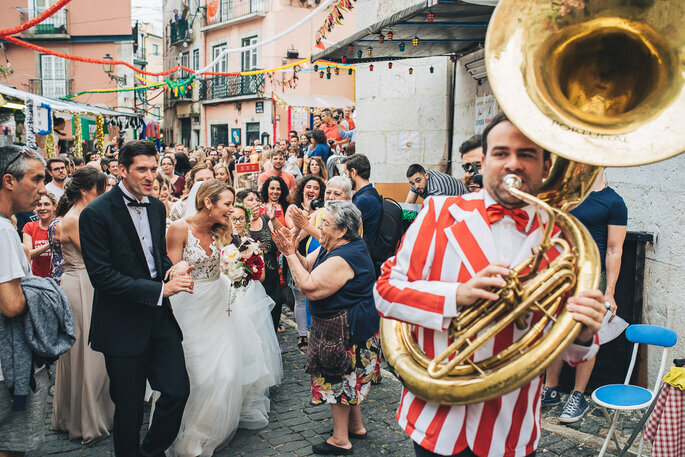 Decorations line the streets through the weeks, and lively music can often be heard – and seen! 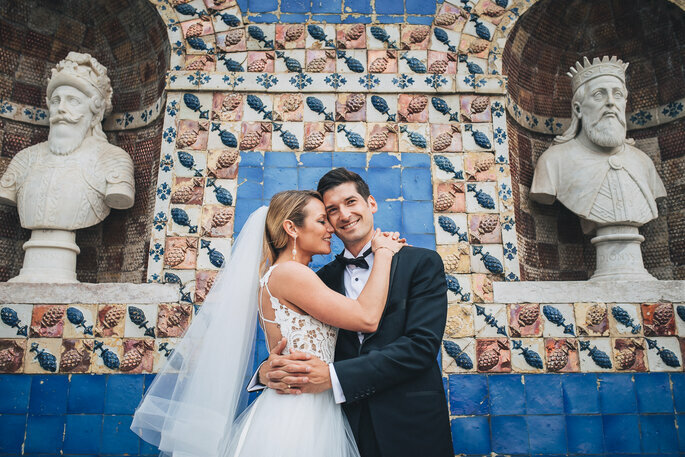 This was the perfect colorful and exciting backdrop for Lindy and Aaron’s special day, and one that we’re sure enhanced their wedding even more. However, the true magic of the day was unveiled at their reception. 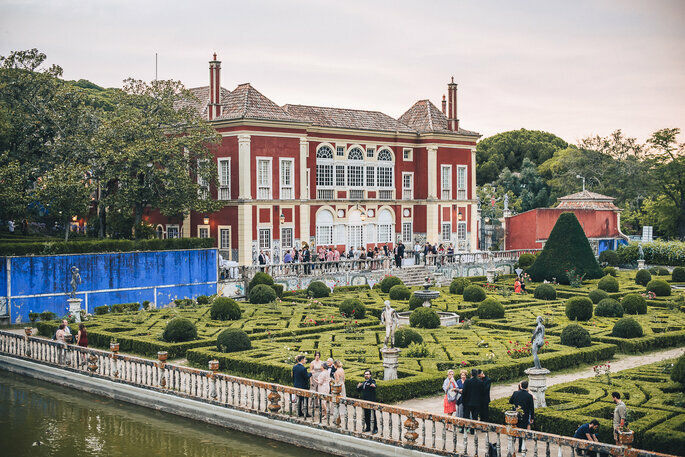 The Palácio Marquês da Fronteira is a widely renowned Portuguese palace, and as you can see, one that is very impressive! 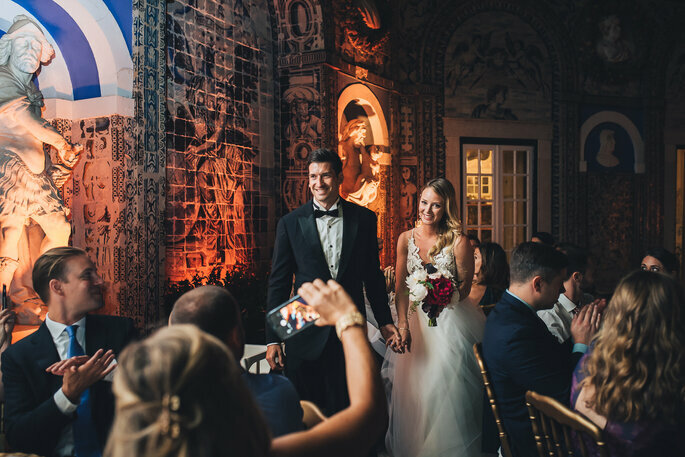 Here, the couple enjoyed a private photo shoot before their reception began, exploring some of the most elegant spaces available at this venue. 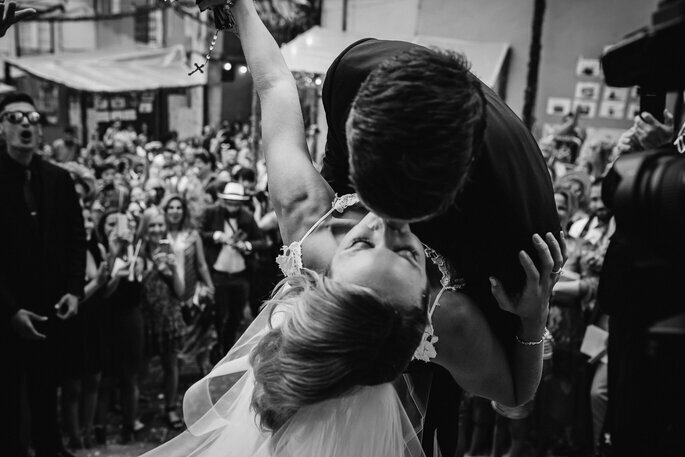 The love between the two of them is clear in the photos, and we wish them the very best together! 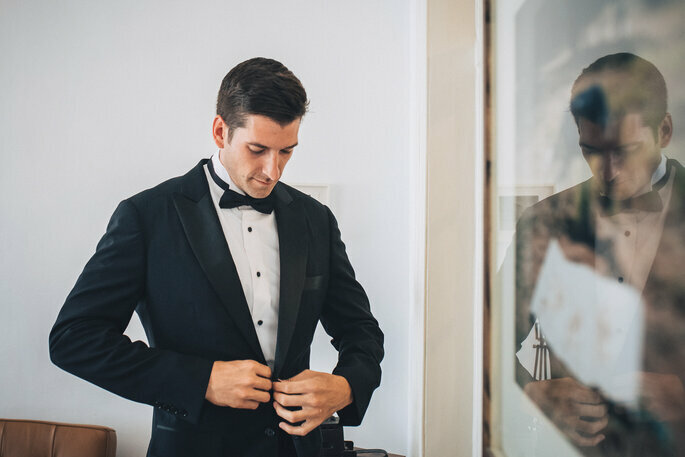 Aguiam Wedding Photography have come to specialize in Destination Wedding photography due to the high number of couples who choose the country as the perfect place for their nuptials. 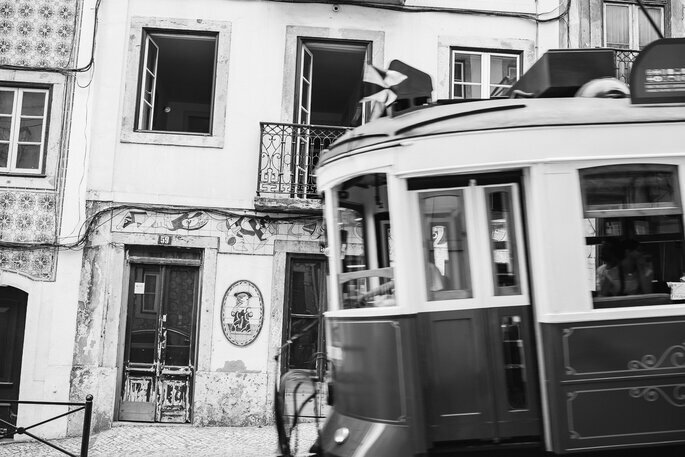 Capturing the vibrancy of Lisbon would be a challenge to a lesser group, but this talented team of photographers are more than up to the job. 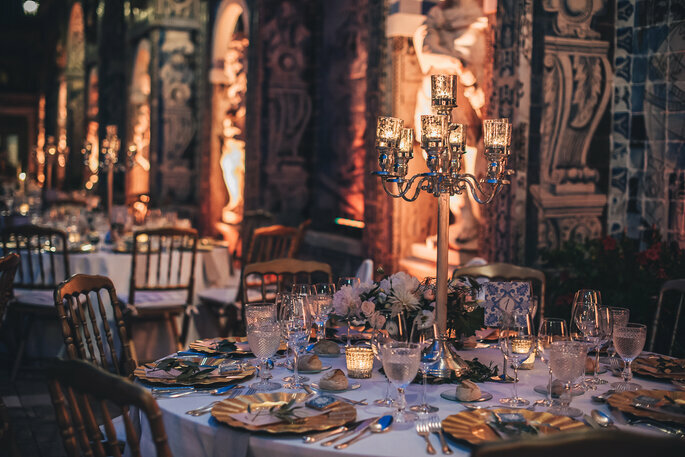 In the evening reception, they captured the essence of Lindy and Aaron’s reception, which was decorated in a vintage style, with delicate glass features and interspersed with gold aspects and floral décor. How beautiful! 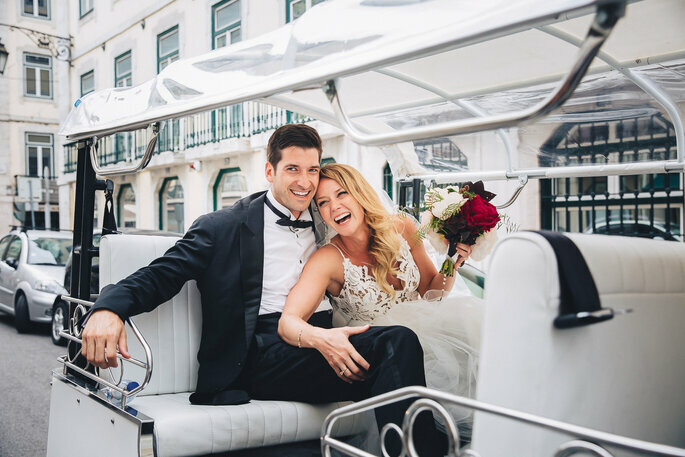 Congratulations once again to Lindy and Aaron, and we hope married life is treating them as well as Lisbon did on their wedding day! 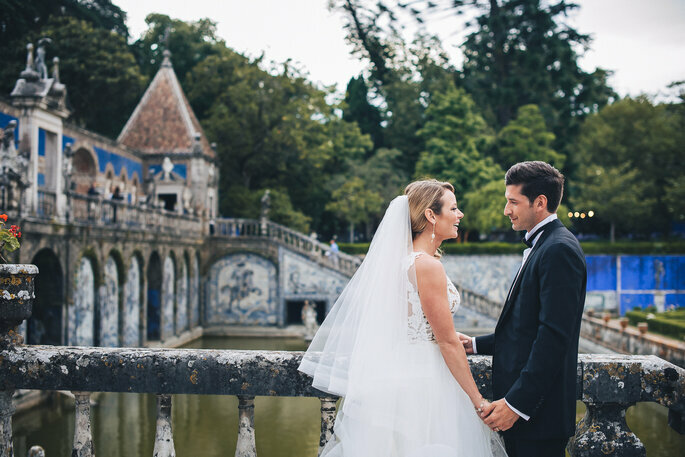 Credits: Photography – Aguiam Wedding Photography; Hair stylist – Facto Hair; Jewelry – Thomas Knoell; Bridal shoes – Kate Spade NY; Cufflinks – Cara ó Coroa; Church – São Miguel; Music – Cottas Club Jazz Band; Floristry – Marta Ivens Ferraz; Videography – Shot and Cut Films; Reception venue – Palácio Marquês da Fronteira; Catering – Casa da Comida.